Mrs Annie E. CLARKE (mother), North Branch, Milton, Otago. Later of 42 Villia St, Masterton. Height 5 feet 7½ inches. Weight 136 lbs. Chest 29½-33¾ inches. Complexion dark. Eyes dark brown. Hair dark brown. Both eyes 6/6. Hearing and colour vision normal. Limbs and chest well formed. Full and perfect movement of joints. Heart and lungs normal. Teeth good. No illnesses. Free from hernia, varicose veins, haemorrhoids, inveterate or contagious skin disease. Vaccinated. Good bodily and mental health. Very slight varicocele on left side. No fits. Deemed "fit". William Thomas Clarke was the second son of George Ishmael William and Annie Elizabeth Eva (Betsy, née Walters) Clarke, of North Branch, Milton; his father being later of 42 Villa St., Masterton, Wairarapa, where he died in 1927. He was born on 16 January 1893 at Geraldine and received his early education at Scotsburn (Peel Forest) School. His father, George Ishmael William Clarke, arrived at Tautaku, South Otago, on 5 November 1901, bringing his mill from Peel Forest, South Canterbury. Because of his father's poor health, the family went into dairy farming at North Branch, Milton; the mill was operated by a relative and other managers until all the assets including the mill and timber rights were sold in 1913. Prior to enlistment William was a partner in the family firm of Messrs G. W. Clarke and Sons, dairy farmers, and was a farmer residing at home at North Branch, Milton in 1914. W. T. Clarke, Infantry, of Milton, was part of the South Otago quota of the 20th Reinforcements –a number which exceeded the allotted quota - who departed from Milton by the 24 August 1916 morning express. On an evening before they were entertained at complimentary by St John’s Club and the Y.M.C.A. branch. They were heartily farewelled as they left. While in camp in September 1916, Private W. T. Clarke of J Company 20th Reinforcements, was temporarily appointed a lance-corporal. Embarking at Wellington on 2 January 1917 per the “Opawa” he was destined for London, England, from where he proceeded overseas on 28 May. William is another serviceman who seems to have gone through his overseas war service relatively unscathed until the fatal blow at Passchendaele, just over four months later. He was killed in action on 4 October 1917, aged 23 years and 4 months, and was initially buried between Otto Farm and Tofel Passchendale Road (probably where he fell in the Field). Subsequently he was interred in the Poelcapelle British Cemetery at West-Vlaanderen, Belgium. 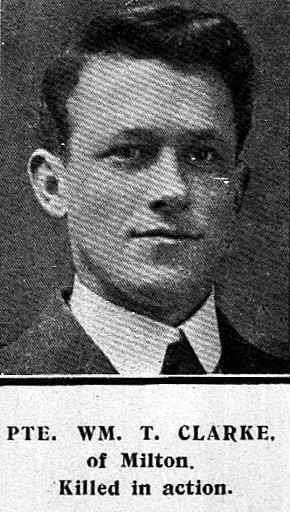 His name appeared in the ‘Bruce Herald’ “Death Roll” of 25 October 1917. In August 1917, the Milton Branch of the Y.M.C.A. had unveiled a roll of honour of the members of the association who had answered the Empire’s call and gone forth to assist in upholding her cause. The mayor who performed the official ceremony, took as the basis of his address the words of Solomon in the Biblical Book of Proverbs – “A good name is better than riches.” He went on to say that too much honour could not be given to those boys who left their homes to fight in this great and cruel war. They were proud of the boys of Milton and district who left for this purpose, and although their hearts were torn with the knowledge that some of them would never return, they were satisfied that under whatever circumstances they were placed they would nobly do their duty to God and man. Some of the 47 named on the panelled oak roll of honour had already lost their lives and before too long William Thomas Clarke was to join them. William also took a keen interest in Presbyterian Church activities, and was a tenor horn player in the fourteenth Regimental Band (South Otago Regiment with which he was serving at the time of enlisting). A poignant phrase attached to his death notice in the ‘Otago Daily Times’ and ‘Otago Witness’ read “Asleep in Jesus.” While in camp William drew up a Will, appointing his father as executor and bequeathing all his real and personal estate, including lifae insurance policies to his father, and if his father should predecease him, to his mother. A certificate of death from the Registrar General was provided for probate to be granted. His older brother George John Clarke enlisted but was not medically fit enough to serve overseas. And another brother, Donald Charles Clarke, was called up but did not enlist.